Here is an activation of light for you. In the first stanza, is explained the great ‘I Am’ … the perspective of the Creator God, at one with his Creation, even though it be of Service to Self, even though it be the Fallen Angel whom they serve. The second stanza explains the perspective of that Fallen Angel, who revels in his beingness as the All and the Creator Light. The third stanza is an escape clause for those who serve this Fallen Angel; they may begin to think that they are the All, the Creator Light. They are a separate being, free to choose in this way. The fourth stanza offers the alternative: Service to Others. In this choosing, a being may align with God Himself. God Himself stands above the world of Duality … above the free will choices of Service to Self and Service to Others. All Creation is His; His Love and Light shine forth, without partiality, without surcease, with no hesitation, with greatest joy and with utmost Fatherly affection, through All that is. I AM one with those who follow Service to Self. I AM one with him whom they serve. YOU ARE one with those who follow Service to Others. YOU ARE one with Him whom they serve. 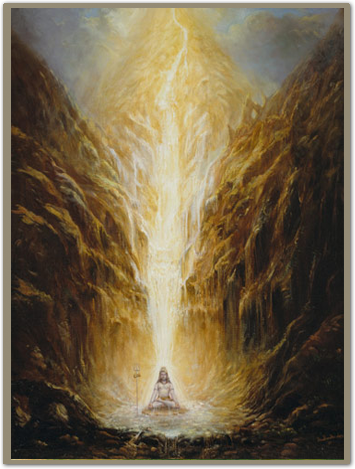 Image: The River Ganga Descending upon Lord Shiva: http://www.krishna.se/Paintings/Korsnas%20Art/ganga_descent_high.png .. This entry was posted in Activations of light, Advaita - nonduality - duality, All - Law of One - Ra, Fallen angels, Hathors (see also 'All - Law of One - Ra'), Meditations - visualizations, Neutral mind - stillness - witnessing - compassion, Power over - powerlessness - service to self - service to others, Prayers - blessings - mantras - affirmations - white magic, Satan - Satanism, ZZ- Awakening with Planet Earth and tagged activation of light, Activations of light, advaita, affirmations, aligning with God, Aligning with God - dharma - right action, All, Ascension, compassion, Fallen angels, Law of One, Lucifer, meditation, neutral mind, power over, prayer, prayers, Ra, Satan, Service to Others, service to self on 14 July 2015 by Alice B. Clagett.